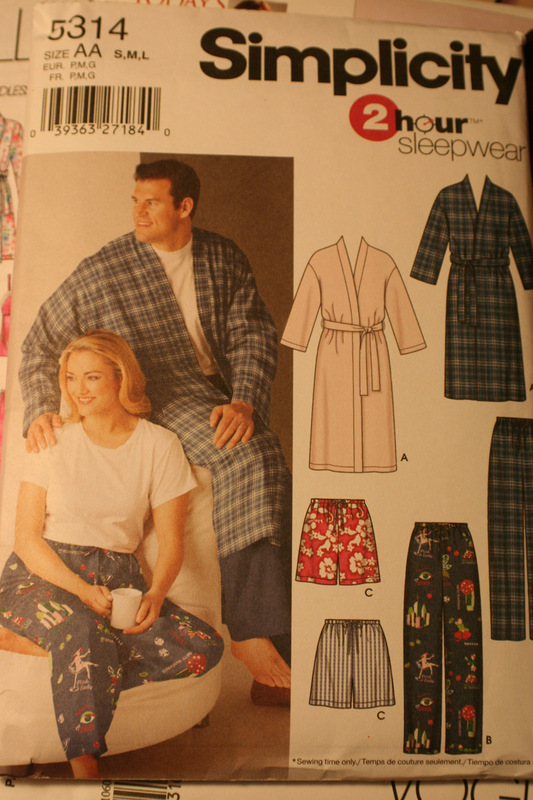 After spending some time yesterday scoping out bathrobe patterns, I’ve changed my mind: I do in fact want a bathrobe “to meet the Queen”.Â My reasoning is pretty simple: bathrobe patterns are simple and boring, and I am constitutionally incapable of doing anything boring!Â Also, it would be fun to enter the bathrobe into various weaving shows, and if so, it should be a svelte, graceful, knock-your-socks-off bleeding-edge-of-hot-fashion bathrobe.Â I mean, imagine the fun if a bathrobe won a fashion show? 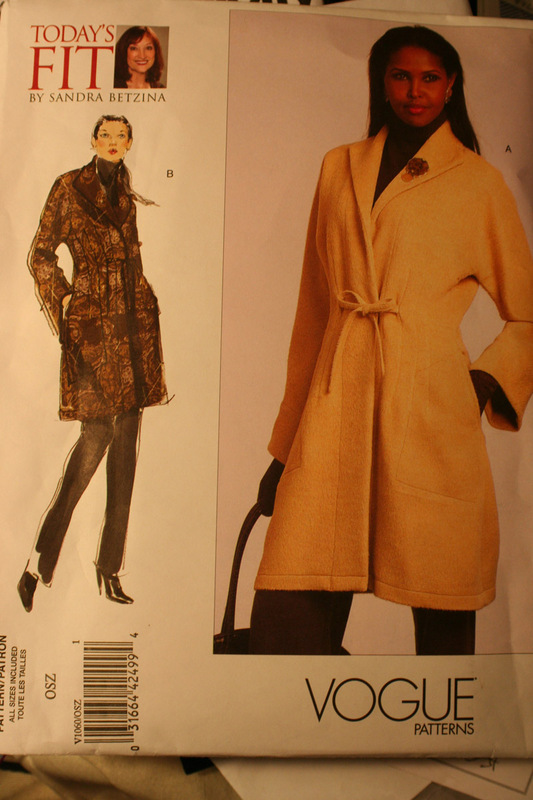 The one problem with the two coat patterns is that they call for 60″ fabric, and I only have a 24″ loom.Â I figure I can piece together three lengths of fabric into a 60″ fabric, but that does limit my options for imagery: if I do motifs, I have to beat super-consistently so the motifs match along the sides, which is unlikely, so I’ll need to do some sort of continuous pattern like the Celtic braid.Â I think I would also line the coat/bathrobe, on the grounds that a handwoven anything should really be lined, and the coat doesn’t currently have a lining in the pattern.Â So I’d have to construct my own lining pattern. 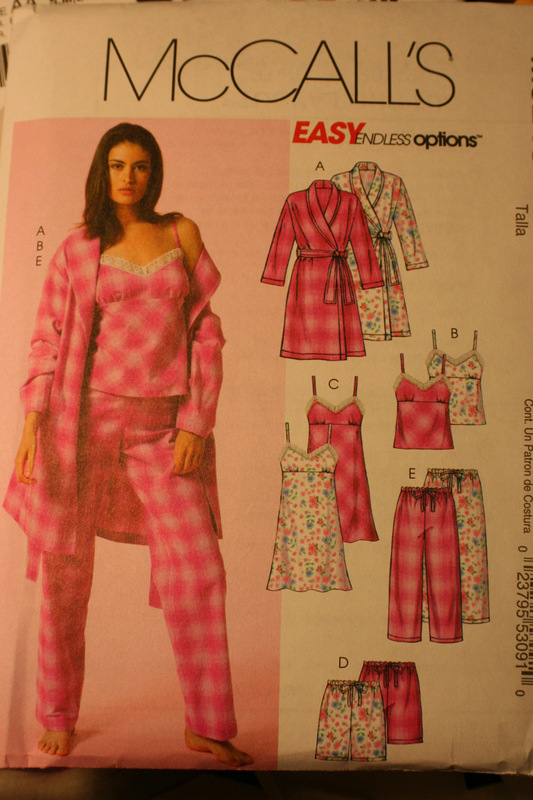 I am currently considering my draft for the bathrobe.Â I’ve just realized that diversified plain weave has very few pattern threads compared to the thin threads.Â If I use 16/2 cotton as the thin yarn and 1450 ypp cotton as the thick weft, and sett it at 24 epi as Laura recommended, that only gives me 8 pattern wefts per inch!Â Which, if you use 24 shafts threaded up with the pattern shafts ascending in a straight line, means that my pattern repeat would be three inches wide!Â That’s HUGE! !Â I’m having a hard time wrapping my head around using such big repeats.Â I’m used to repeats of half an inch to an inch in the warp, because I tend to work in fine threads on straight draw. As a result of stepping outside my habitual designs, I’m a bit at a loss for patterns to weave.Â So I’m putting that question on the back burner and will start the other pre-work, like sewing muslins and dyeing the cotton chenille yarn, later today.Â (I’ve decided to ditch the Christmas cards, as you may have guessed.Â It sounds kinda interesting, but after the chocolates and the book, I’ve had enough of working under tight deadlines for awhile. )Â I also need to weave and wet-finish quite a few samples before I really understand either diversified plain weave of cotton chenille, so there is a good bit of work involved before I start doing up my final draft!Â Fortunately, because of the structure of DPW, it doesn’t really matter what pattern of colors I finally choose, it won’t change the drape or behavior of the fabric much (I think).Â So I can start experimenting with sett, fine threads, etc. without worrying too much. Today I will also run up to the KPFA craft show in San Francisco, partly to see Sandra Rude and partly to get some Xmas shopping done!Â Despite sending out chocolates to all and sundry, I’d still like to get presents for my immediate family, which means doing a little bit of shopping. Tien ~ Seems to me that the Sandra Betzina pattern, if elongated to the ankles, would be quite elegant indeed. Unclear what’s happening in the back on that one, but the collar and the unusual tie arrangement look dang good. Random thought on fabric width–if sleeves are set in, the fabric wouldn’t need to be so wide. I, too, like the unusual tie arrangement on the Vogue pattern. 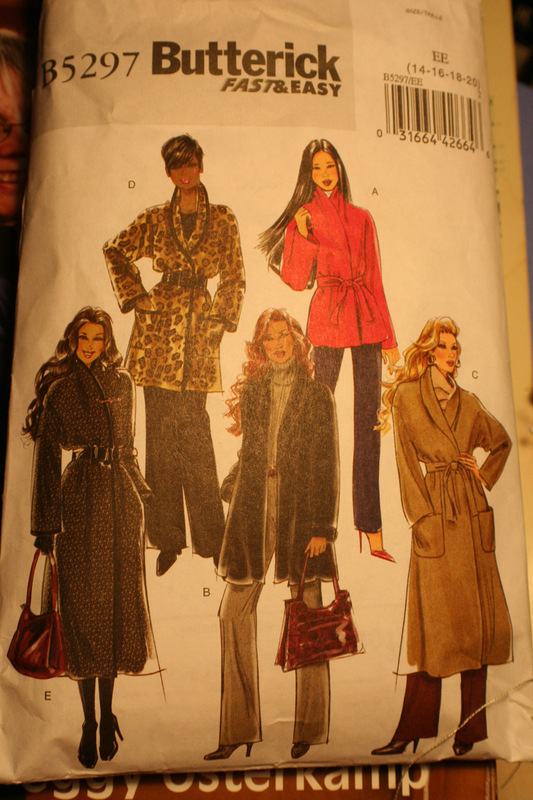 Tien, I use to adjust patterns to fit my weavigns, 24″ wide is more than enough for any garment. You just need to weave more yards. Consider making a seam in the center back, them mesure the widest part of the pattern add take up and shrinkage, this will be the width that you will need. Spread your pattern pieces on the floor, one after the other one. Add to this, take up and shrinkage, add a bit more for sampling, this will be the minimum length you will need.